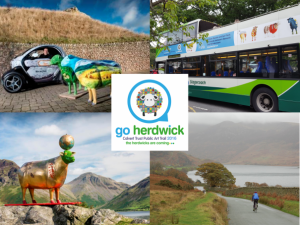 As part of the Go Herdwick public art trail, and to celebrate the start of the school summer holidays and the Herdwick’s iconic role in the sustainable history and landscape of Cumbria’s countryside, we are organising a “Eco-Travel Challenge”…to see a named and set number of the delightful flock within 7½ hours using only sustainable forms of transport! The challenge is all part of the Calvert Trust’s Go Herdwick fundraising project to redevelop our historic tithe barn in Keswick into a specialist rehabilitation centre for those with acquired brain injury. Will ‘Ewe’ Take The Challenge? Call 01768 772 255 or email info@goherdwick.co.uk to enter! Starting at 9:30am from a choice of either Keswick Marketplace, or Bowness Pier at the far south of trail, each team will need to have seen (and photographed) all the nominated sheep on the course and reach the other end of the trail by 5pm that evening. 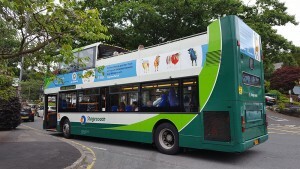 This might sound easy, but travel can only be done by using sustainable transport – be it on foot, bike, boat, bus or electric car- with the route covering over 30 miles through the centre of the Lake District taking in the towns of Keswick, Grasmere, Ambleside, Windermere and Bowness-on-Windermere and not forgetting the climb over Raise in the middle. The event will take place on Tuesday 2nd August and is open to all ages, and teams must be two or more people, with them either doing the challenge to raise money for the Trust via sponsorship, or just for fun! To further make it a great day for all the family, the Calvert Trust will be offering families taster sessions of catamaran sailing in Bowness-on-Windermere and the opportunity to experience the electric All-Terrian BOMA at Keswick Marketplace. In addition, both locations will be offering face painting for the little ones, as well as selling maps for both the Go Herdwick ewe and lamb trails. or email us at info@goherdwick.co.uk. 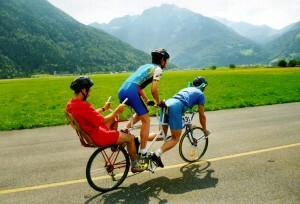 Many thanks to the teams who have already signed up for the Challenge – Team Calvert Trust will be on their bikes, Team Stage Coach will be jumping on the 555 bus and teams from Castlerigg Hall, Keswick Brewing Company and Blencathra FSC will all be getting behind the wheels of Twizzy electric cars!